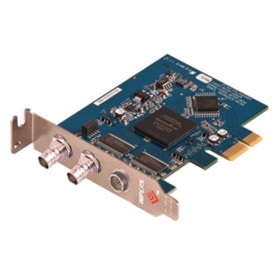 IMPERX VCE-HDPCIe01 is a professional level PCI Express video capture card that enables users to view and store in real time megapixel video images from any standard HD-SDI video source onto desktop PC computers. IMPERX VCE-HDPCIe01 is capable of capturing single or multiple frames and standard AVI clips from any SD or HD-SDI compliant video source. Each captured frame can be stamped with a user message along with the date and time of capture. A full software suite that includes drivers, C/C++, SDK, and an application program is provided with each IMPERX VCE-HDPCIe01 video capture card.